Indosoft provides technology for hosted Contact Centers, also popularly known Contact Center On-Demand, a complete, scalable, multi-tenant contact center software suite that includes ACD, IVR, CTI, Predictive dialing, voice recording with a complement of powerful administrative and management tools. With improving internet access and VoIP connectivity, contact center as a service has gained in popularity. Why Q-Suite for your hosted multi-tenant platform? Q-suite multi-tenant call center software suite for Asterisk is a mature platform capable of providing sophisticated inbound ACD with call routing based on skills and service levels. Q-Suite has a robust self pacing predictive dialer capable of significantly increasing the agent productivity for outbound telemarketing. GUI based wizards allow for easy management of both the inbound and outbound call center suite tenants. The administrator of the multi-tenant call center will provision the tenant and the number of concurrent seats for the tenant. Once provisioned, a tenant will have the ability to setup the call center suite to suit business requirements of the operation. There are a significant number of salient features that make the Indosoft contact center software suite the ideal for hosted multi-tenant deployment. 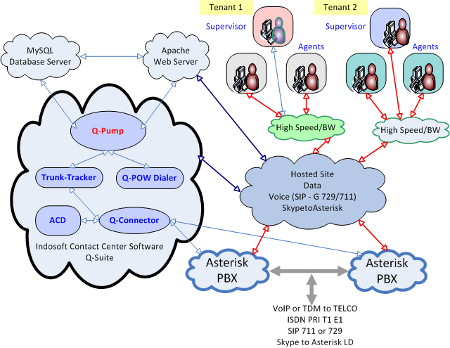 The agent devices can be configured to be either TDM or SIP. The agent screens are web browser enabled and can accommodate third party web applications as well as legacy main-frame emulators. The initial voice connection for the agent is setup by a nail-up call. The campaign management tool allows the creation of multiple lists and each list loading is identified by batch. The powerful script builder tool allows creation custom scripts and integration of web applications on a multi-page format. Hosted contact centers with remote agents offer distinct advantages. It reduces the overhead required in managing and running a premise based call center and makes it very flexible. For the service provider, its multi-tenancy model provides the ability to sell call center as a service. There are many good reasons to setup hosted contact centers. For individual businesses it gives them an opportunity to take advantage of home agents and eliminate large office space costs. With data centers eager providing quality hardware, internet bandwidth and SIP termination it is a a serious option to consider. For contact center service providers, it is an opportunity to provide contact center on-demand as a service and generate recurring revenue. Q-Suite will meet the requirements of both individual businesses as well as service providers. It comes with a powerful administrative portal which controls access to the functionality of the contact center based on roles and privileges. You can find more information about voice quality, codec and bandwidth in our blog. Q-Suite is a true multi-tenant contact center software allowing you to setup tenant partitions which are separate. The Admin Portal will allow the Super user to truly control the tenants without having to manage every aspect by enabling all aspects of the contact center except trunk setup and tenant control. The tenant can setup a hierarchy to allow different roles within the organization to view and manage screens and reports pertaining to their role. Q-Suite offers one of the best self pacing dialer for multi-tenant setup. It can operate in predictive, power and agent-ready mode. Q-Suite offers the ability to manage and control outbound campaigns and inbound services effectively. You can set up inbound services with multiple DNIS (B-Numbers) and service specific call routing using our GUI based dialplan builder. There from setting up agents, queues, lists, dialer, scripts and dispositions, all available within simple intuitive graphical user-interface. Q-Suite is truly a contact center in a box for Asterisk. Modern data centers provide very good hardware and infrastructure as well as good connectivity. The hardware requirement will be determined by the capacity of the call center. Bandwidth of both voice and data need to be considered. Typically voice requirements will be between The data bandwidth can be around 25-30 Kbps for web intense Agent screens. The other important factor is the overall delay. For good voice quality, the ping time should be in the order of 100 millisecond for VoIP terminations. ISDN PRI E1/T1 is a safe option when VoIP is not readily available. Bonded T1 is becoming very popular in U.S.A.
Q-Suite offers web browser agent screen that can be customized and controlled using a powerful set of tools available within the call center software. An extremely sophisticated Script Builder for creation of scripts with custom variables and embedded URL like any web enabled CRM or web-sites. Custom disposition or wrap-up codes as well as custom DND codes allow for detailed reporting of agent activity. If you are one of those companies who have invested in building native application for the agent CRM and want to integrate CTI into it, we provide a comprehensive set of API interface to the call center software suite. Like many of our existing clients, if you are a vertical outbound call center with special application, our API can accommodate and provide all the necessary interface for the agent to be logged in and receive calls based on "predictive dialing" or be in a blended mode. Q-suite offers a very powerful .NET library as well as an OCX library to integrate CTI software into your existing custom and native client applications. The .NET API provides complete access and interface to the call center software and its CTI database. This provides you with the opportunity to make the call center software and its CTI engine to work under the hood with your custom CRM or application. Q-suite offers comes with a socket library to allow easy integration of your existing custom CRM or application to the call center software and its database. If you are looking to migrate your vertical application to Asterisk and need a powerful CTI engine with a fully developed ACD, the Q-Suite socket API will provide all the hooks and interface to this powerful call center software. Indosoft call center software offers detailed cradle to grave reporting for your contact center operations. These reports cover every aspect of the contact center operations. Agent performance, queue performance, lead performance and dialer performance can be monitored real-time.